Restaurants Pest Control Pest control is vital to a healthy commercial restaurants. Infestations ruin inventory and care away customers. of food service consumers found that more than 50 % of frequent restaurant diners would tell five or more acquaintances about a pest sighting at a restaurant. Nearly three out of ten respondents said a cockroach sighting would cause them to leave an establishment and never go back. At Truly, we know the preferred areas viz. Waste Area, Food Preparation and Dining Areas, Storage Areas, Outdoor Areas etc. 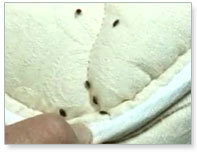 for pests in your restaurant and our Truly tested protocols will take care of these areas. Hotels Pest Control At Truly, we understand the pressures of public perception and regulation that Hotel owners and managers face when building and maintaining a quality reputation. Sensitive areas like Guest Rooms & Suites, Lobbies, Kitchens, Food Storage Units, and Dining Areas require specific sanitation measurements and precautions to maintain a healthy environment. When it comes to pest management, you need a sound, reliable protocol to protect you. Anti Termite Treatment to Masonry Walls If you are planning to build a house or develop your property for building your office, termite control is the first thing you should think of. We use highly professional and advanced techniques for treating the termite infestation problem. Direct liquid treatments are applied to the outside, inside and also in the foundation to eliminate the termites completely. Direct injection of liquid pesticide (termiticide) to masonry walls, within the foundation walls and also areas under the concrete slabs is part of our specialized termite control treatment plan. professional Pest Control Cockroaches are difficult to control, mainly due to their habit of laying egg pouches, containing numerous eggs, in inaccessible areas. There are two main species, Oriental (blatta orientalis) and German (Blattella germanica). Both these types of roaches have different habitats and habits and also look rather different from each other, so it should be fairly easy to identify which species of cockroach you are dealing with. Oriental Cockroachs are generally found at floor level, are large (20-24mm), broad and reddish brown in colour. Reasonable climbers so check higher levels for activity too.. German Cockroaches are more often found off floor level and these are small (10-15mm) slim sandy coloured insects with clearly visible wing structures which are not developed sufficiently for them to fly. Excellent climbers, hence the higher levels at which you will find these cockroaches, they can even walk on ceilings and undersides of cupboards!